Author’s Notes: I do not know about the structure of the caves of Woodland Realm, so I make it out of my own head, trying not to give exact details – which I don’t have. I think that there are bigger halls and smaller halls (wow, I even surprise myself with this master conclusion) and I put few of the biggest halls soon after the main entrance. The centre of all is the Main Hall, where most of the celebrations are held. Of course there is also “throne room” and such places, but I guess you can you all can make out your own image with your imagination. I think that my own inner image could be quite near the reality, but of course there can be bigger halls deeper in the caves as well! Inform me, if you have inform based upon Thranduil’s kingdom, I would be most grateful. And review… I’m even more grateful of that! And who ever invented that Gimli’s “dearest heart” –phrase: you are a genius! I borrow it, because it fits to Gimli so well. Even our rough Dwarf has his soft side, right? And I think it’s only a good thing. “He has already retired. Our journey into the forest exhausted him, it seems,” Legolas replied somewhat guiltily. “So I assume you already feel better.” Legolas nodded. Lossaurion looked at his brother carefully, and then smiled brightly. “Well, that is good, because I couldn’t bear watching you sulking around while others celebrate. And in the case you didn’t notice, you changed into Westron again,” he smiled knowingly. Legolas laughed, and together they started towards the Main Hall, where the others would be waiting for them. When they entered the Hall, it was already full of Elves, the air filled with music and laughter. Swiftly the two Princes made their way through the mass of Elves, trying to find their older brother, the Crown Prince of Eryn Lasgalen. For their credit, they found him soon enough. “Ai, Las! Here at last. We already grew worried if you would come at all,” the older Elf said. It seemed that he didn’t even bother trying speaking Sindarin with his youngest brother. “Where is Gimli?” he asked somewhat disappointed. “He went to bed already, but I am sure he will join us tomorrow,” Legolas replied, inwardly pleased to notice that at least his brothers were in good terms with the Dwarf. “Rafél calls him thus, I have heard,” Tirifëa said. “Well, I guess he’s family enough,” Lossaurion decided. Legolas smiled a little. There was a price to pay when you were the youngest of the family, especially when your older brothers were many centuries older than you… And indeed Rafél as well called him by such nicknames, but he was close enough to Legolas to do so – as well as the protectors of Legolas’ brothers. “)My Lords,(” came a voice suddenly from behind them, and all the three Princes tuned to look at the newcomers. Legolas welcomed Rafél with a bright smile, clasping hands with his former protector. Then he turned to the other two arrivals. “)Well, my Prince, we had duties, and believe me, we were most hurt when we heard that you had arrived without our notice,(” answered Aduifan, who was Tirifëa’s bodyguard – still, even if someone could have thought that the Crown Prince was old enough to take care of himself. But after all, being bodyguards was nowadays only an excuse for those Elves to stay close to their Princes all the time: constantly watching and protecting, yes, but mostly as a friends and advisors. “)That is no excuse: entire Eryn Lasgalen knew Legolas and Gimli were coming,(” Lossaurion argued, his eyes sparkling. Mîrfanya was just about to reply to that, when there suddenly came a knife flying across the air. Faster than an eye could see, Rafél moved and caught it, only few inches from Legolas’ face. “Oh, Rafél! You spoiled our fun,” whined a blonde Elf who strode closer to them. “)I should have known…(” muttered Rafél darkly. “Gimli?” Legolas asked, rising one eyebrow to Asthaldo before him. “Correct,” laughed Asthaldo, before pulling Legolas into a tight hug again. “Somehow you managed to avoid us yesterday,” Asthaldo said, pouting, as they drew apart. Legolas laughed, shaking his head. “Well, I think that wasn’t a great loss, for my mood wasn’t the best one, after I had spoken with my brothers” he said. “Ah, so you have also heard of your father’s latest adventures,” joined another voice, and Thalión emerged from the crowd of Elves, his face serious. “And today he fumed around, most of the day,” Lossaurion quipped. Legolas glanced at him darkly. “You did? Oh, poor Las! And even more so, poor Gimli,” Asthaldo retorted, while absently putting his shorter front hair back behind his ear. “Well, Gimli is quite fine,” Legolas said. “So fine he isn’t now here with us,” Asthaldo stated with a risen eyebrow. Legolas merely grumbled, making the others smile. “Now, enough of harassing him,” Tirifëa said at length, his voice full of authority that was expected from the Crown Prince, of course. Others looked at him, and then burst into laughter. Legolas also smiled, knowing that none of these Elves meant to hurt him: it was just their way to welcome him back home. “Rafél, it was merely a game. If you wouldn’t have stepped in, I would have caught that blade myself,” Legolas said to his old protector, trying to persuade him to let go of his old habits of protecting him. Rafél had protected his Prince since Legolas had been only a small child, and protectiveness towards Legolas was only expected, even if Rafél formally wasn’t Legolas’ bodyguard anymore. Not since Legolas joined to Fellowship. With a somewhat reluctant movement, Rafél gave Asthaldo back his knife. Asthaldo accepted this with a smile and nod to Legolas’ direction. The group continued to talk for a while, and then they split to their own ways, for the night was still young, and there were many friends and people to see during the night. Much later that night laughter and happy voices still filled the air. If Legolas had been on a bad mood before, he certainly wasn’t so anymore. Elves around him drank and talked, a fair music was played and nothing seemed to be wrong. Yet Legolas felt that something was amiss. He shook his head, driving such thoughts away. The only thing that was wrong was that Gimli wasn’t here, but in his rooms sleeping. But he rather gave his friend a sleep he needed than forced him to stay awake. There would be plenty of time for celebration later. And of course there was another thing amiss: his father wasn’t present either. He had spoken with his brothers yesterday, but they knew little of their father’s recent moves. No one knew anything specific. It made him bad-tempered. “)Give me a moment of your time, my Prince(,” a captain of Eryn Lasgalen said quietly. “)Of course. What bothers you? Le maien dele. (” Legolas asked, wondering what ailed his long time tutor. You cannot worry Thrénandu easily, so I wonder what is wrong, he thought. “)You know something? (” Legolas asked sharply, his all senses suddenly alert. He hadn’t found Thrénandu yesterday, for the Captain had been busy with his duties. Legolas nodded and watched Thrénandu disappear to the crowd. He sighed and rubbed his temple. The feeling was growing more persistent, nearly overpowering. Something was approaching. “Legolas?” Again! This is becoming to be a habit to me, Legolas thought as another voice startled him. Turning his head, he looked at the direction where the voice had come. Beside him stood Thalión, smiling to him carefully, knowing that Legolas didn’t like to be surprised. “Thalión. Already lost your cousin?” Legolas asked. “Truly? How’s so?” Legolas couldn’t but ask. “As he has grown fond of many other new things as well after the War,” a new voice added. Both Elves turned to welcome the third, Thalión’s cousin Asthaldo. “But we can still linger in the memories of those times when Legolas was only a novice, and we were among those who taught him to survive in the darkness of Mirkwood,” Thalión said, smiling at the memory thousands years old. “But you never taught me how to use a bow,” Legolas argued. “No, that was left for those with more skill and knowledge how to treat spoiled Princelings,” Asthaldo laughed. Legolas glared at him, and that wasn’t a friendly glare. Thalión shook his head in amusement, making his braids sway. “So, where is Dínnor?” Legolas asked. “He is visiting the Galadhrim in Western Lórien. Khai and Ithika invited him there,” Thalión answered. “And why didn’t you join him?” Legolas asked interested. “So, how is he nowadays? You two have stayed in your styles pretty loyally I see,” Legolas noted with a bright smile. Thalión and Asthaldo had known Legolas since his youth. They also were ones of those very few who knew Legolas well and had befriended him through the ages. They had first met when Legolas was a novice and practised skills of a warrior, and they soon became friends and stayed that way during the years after. Legolas had learned a lot from them, for the Cousins had travelled far and wide during their long years on Middle-earth. They were both known warriors among their own kin, but not those of whom the great song told about. On the other hand that matter didn’t seem to bother them too much; they liked to keep their privacy – though they always welcomed Legolas’ company. Because of their travels and what they had seen – or that’s what they both said – they wore their hair differently than the other Elves. Many older Elves said it was total foolishness, but the Cousins thought it was merely a bracing change. Asthaldo had cut his front hair quite short, so it just reached behind his ears while the rest of his pale golden hair was as long as the Elven locks usually were. Thalión had a long silver hair, and only thing that was different in it was that the upper layer of hair was always braided to little braids, with some blue straps. He said it looked nice, and Legolas himself thought it looked quite good, because Thalión’s hair was naturally very thick. They also had a third cousin, Dínnor, who was right now in East Lórien visiting his friends. Dínnor was the oldest and most impulsive of the three, always ahead of the other two, and he also had been the first to chance his hairstyle different from the customs of the Elves. Last time Legolas had seen Dínnor, his whole head was braided in small braids – a style he had kept as long as Legolas remembered. “And I thought that you are one of those who aren’t blessed with foresight,” Asthaldo sneered. Thalión silenced his cousin with one small movement, which would have went unnoticed to any other, but Legolas saw it, smiling to the silver haired Elf. “I am not blessed with foresight, but maybe with foreknowledge,” Legolas said. “And you know how many times he has been right about these kind of things,” Thalión reminded his cousin sternly. The only answer Asthaldo had was a shrug. Finally he asked: “Are you sure? Because I think no one else here feels anything unusual. Maybe you just have become paranoid after being too much in the company of –” Asthaldo quickly bit his lip before he would say too much, but the mistake was already made. “You know?” Asthaldo squeaked. Though he wasn’t among those who spoke of the bad influence, which the Mortals had upon their youngest Prince, he had heard about those things – and warned the ones speaking never to mention of their opinion of the matters to Legolas, or to his friends, especially those who were mortals. But it seemed that Legolas was fully aware of those things said behind his back, and Asthaldo wasn’t quite sure if that was a good thing. “Oh, of course I know. I am a Prince, after all,” Legolas smiled. Legolas smiled and nodded. He was glad that at least his best friends accepted his friendship with Gimli, and weren’t against his attempts to bring peace between the two races. Legolas barely heard. His mind stubbornly turned itself towards the feeling of darkness, and Legolas grew even more curious. He pushed himself away from the pillar, and took a step forward at the same time as his mind tried to reach that whatever was approaching. He distantly felt someone grab his hand and heard voices, but they were now too far away to be heard. He took another step towards the darkness, as well as he took another step in a real world. Then something happened. The darkness charged forward, and Legolas’ only choice was to pull back from the onslaught, or to face it – which could have ended up badly on his side. He retreated. Gasping with shock, Legolas returned to reality, blinking his eyes and trying to steady his breath. Thalión stood before him, face worried, and Asthaldo’s grip upon his hand was turning painful. “It’s alright. I’m here,” Legolas said at last, and Asthaldo’s hold loosened a little. “What happened?” Thalión asked quietly. He barely finished when shouts started to fill the air. It started from the halls nearer the main doors, a sound of many voices shouting and crashing sound of metal. Swiftly all the voices became one, great noise that filled the caverns, echoing from the stonewalls. The music froze and all the Elves within the Main Hall stopped in their tracks. The voices of the ones standing near the doors were scared and warning, and the ones deeper in the Hall were getting confused. But the warriors were already alert, sensing that something was amiss. Legolas and his two companions started to push their way towards the main entrance, listening intently at the voices before them, trying to block out everything unimportant. “)Lasto! (” Thalión shouted suddenly. They all stopped, forcing the others around them to do the same, listening. There was the same cacophony of noise as before, but now they could easily identify a clinging of metal against another among it. Every Elven warrior on Arda knew what that meant. They were under an attack. Legolas nodded swiftly, letting the others pass by to tell the other warriors and captains. They have breached inside. That means they surprised the guards, or that their number is too great to be pushed back. But why the scouts did not sent a warning? Legolas’ thoughts ran wildly as he estimated the situation. Finally he glanced at his two companions, who for once waited patiently by his side. One nod from the Prince, and they started to run again towards the gates. They soon reached the doorway of the first hall and stopped dead in their tracks. Legolas had been right in one thing: the Orcs were too many to be pushed back. The Elves in the first hall were in desperate need of aid. From the doors that now stood open Orcs continuously poured in, like a swarming, black river. The three warriors slowed down, using the shadows for their advantage, drawing their knives and readying themselves for attack. But they all knew they needed proper weapons. Their short knives weren’t much good against the army of Orcs. Finally they were close enough to engage to battle, using a surprise as an advantage. Five Orcs were dead before the others even noticed the new attackers. But as soon as the Orcs realised that their enemies got new reinforcements from the inside of the caves, they attacked the Elves with a rage that only those creatures possessed. Legolas and the two Cousins fought together with practised ease, years of training together controlling and guiding them, but the enemy was too many. When the situation became too difficult, they started to seek a way to join the other Elves, who didn’t fare well themselves. After a while Legolas made a decision, which was expected from him, but which he himself had always avoided: he gave an order. “)To me! (” All Elves in that hall rose their heads and started to gather together. Legolas had fought so many years that he knew what to do; the Elves of Woodland Realm wouldn’t survive if they stayed scattered like this. They needed to stay closer to each other, to protect the ones who fought by their side. Slowly the Elves obeyed, bringing themselves closer to their Prince, fighting their way through the enemies’ lines. Legolas dodged a swing of a sword and brought his enemy down a second later. Watching around him he saw that Asthaldo had found a sword for himself from somewhere. Looking about him he soon found out where; the dead no longer needed a weapon. With sorrow and guilt he kneeled down, taking a sword from one of his dead kinsmen. Taking a deep breath, he rose up again, continuing the desperate battle. “I think we need a plan,” Asthaldo shouted from beside Legolas, slicing one Orc nearly in two pieces. Legolas met the fallow eyes and nodded. He didn’t need Asthaldo’s years and experiences to know that they wouldn’t fare long like this. Asthaldo crashed into Legolas, and they swiftly changed places, Legolas’ sword piercing the approaching enemy. “I think that Asthaldo’s right,” Thalión added from his place. Both cousins nodded hastily, while still fighting. Legolas tried to think of something that could be called a plan, but it seemed to be too hard at the moment, because if his thoughts strayed even a slightest, he would get at least three blades to his body in an instant. How Aragorn always makes this look so easy?! Forming a plan has never been one of my best sides, and in the midst of the battle like this… Where are you my brothers? Somewhere in the middle of the battle, I suppose. But by the Valar, wherever you are, Tirifëa, please hurry with your planning, and start to use your authority of the eldest Prince! Legolas stopped his musings, and focused upon the fight again, just avoiding a blade aimed to his head. “Legolas, today!” Asthaldo shouted, glancing swiftly to the Prince, and then at his cousin fighting a little further way away from them. “Why I am the one making a plan here? You two are far more experienced… )Accursed beast! (” Legolas swore, kicking an Orc away from him, and pulling the creature’s foul knife out of his leg where it had embedded itself. “Do we have a plan already?” Thalión asked as he came closer the other two again, already looking quite exhausted. “I think Legolas’ plan involves him dead, so he wouldn’t have to make any decisions,” Asthaldo said while killing another Orc, eyeing Legolas’ wounded leg. “You can fight with that?” he asked seriously. “Just watch after yourself,” Legolas responded, already in motion once more. “So, the plan…” Thalión tried again. But they all knew they wouldn’t go much farther without a plan. The Elves were driven back a bit by bit, or hacked down like a corn in the fields when the rain came down too hard. And now there were drums. Legolas shivered despite himself. Those drums… They brought back evil memories of Moria. Being an Elf, the memory was still fresh, and Legolas didn’t wish to remember that one precise dark part of their journey with the Fellowship of the Ring. The beat of the drums increased and echoed in the tunnels, mixing with the sounds around them. Shouts of the Orcs, sound of blades against one another, cries of the dying Elves and Orcs, moans of the wounded and above all else, the drums. The Orcs got even wilder, drums exciting and encouraging them. Legolas found his concentration slipping dangerously, and he turned to look for his friends. Thalión was engaged in the battle near to him, and Asthaldo was aiding one of the wounded Elves, other’s blood staining his tunic. Legolas raised his sword again, trying to fight his way to Thalión’s side. He knew that alone an Elf would be an easy kill for an army of Orcs. An instinct warned Legolas just before he was hit on the back of his neck. His vision swimming, he was sent to the ground. A moment later a clawed hand buried itself to his hair, twisting his head back so he could see his enemy. A scarred Uruk-hai stared down at him, baring his sharp teeth in something akin to a grin. Legolas froze, readying himself, but suddenly his enemy’s leering face wasn’t on its place anymore, a gush of black blood falling upon Legolas. Before Legolas could make another move, there was a strong hand pulling him up, and as he wiped his enemy’s blood from his face and opened his eyes, he met Rafél’s brown eyes. Relief swept over Legolas, and he quickly nodded to other Elf, smiling. “I am fine,” he assured. “I can see that,” Rafél said, a sharp remark in his voice making Legolas wince. After all, this was his protector and mentor, and if Rafél was displeased, it meant that Legolas had made a mistake. Several mistakes during this battle, actually, Legolas praised himself inwardly. With a nod, Legolas welcomed the silent rebuke, and then found his sword again, knowing that he would hear of his lapses after the fight was over: a battlefield wasn’t a good place to start to go over the made mistakes. “Just fine. Keep fighting,” Rafél said grimly, rising his own Elven blade, and swept it through an approaching Orc gracefully. Soon they were all fighting back against another, deadly dance creating a circle of dead Orcs around them. “I just hate it when you are right about there kind of things! Next time, forecast something nice and peaceful instead of full chaos!” Thalión shouted, docking down and letting Legolas pierce an attacking Goblin. “So now this is my fault? !” Legolas laughed back, killing another Orc and pressing his back firmly to Thalión’s, seeking support and strength from the older Elf. “Asthaldo? No,” Legolas said, his voice getting a little more worried. Thalión nodded, his powder blue eyes full of worry that didn’t belong there. “Then I suggest that we form some king of a plan –” Abruptly a horn was blown several times deeper in the caves, and it was a signal that they needed. Someone seemingly had a plan, for the forces of Woodland Realm were called to the second hall. Quickly as possible the warriors pulled back, protecting each other in the process. But it still took time for everyone to get there, and some never made it, Legolas noticed sadly. As soon as Thalión and Legolas arrived to the hall, Asthaldo located them, Shannai close behind. “Nice mess we have here, aye?” Shannai said rather cheerfully, hiding his fear well. “Don’t say that, for you sound just like a Dwarf,” Asthaldo commented. The others laughed, because that phrase was just like one of those Gimli used in many occasions and especially in the situations like this. Suddenly Legolas froze. “What is it? Are you not well? Is your leg giving you trouble?” Asthaldo asked quickly. “Which are quite deep in the caves. Perhaps he will be able to snore in peace until the battle is over,” Thalión tried to sound like convincing, but it didn’t help Legolas. “Right. So we sent someone to warn him before –” Asthaldo froze, but he wasn’t alone. The drumming had changed and all the Elves fell silent, as well as the Orcs. Then suddenly the Orcs started to screech again, filling the caverns with their war cries. “What’s going on?” Shannai asked quietly. “But aren’t his brothers fighting, then?” Rafél asked, weighting his – or rather his Prince’s – options. To everyone’s surprise there was no answer for that from the young Prince. They all turned alarmed, for a moment fearing that Legolas had made up his mind and left to search Gimli, but no: the archer stood on his place like rooted, staring at the direction of the shouting Orcs, eyes filled with horror. His four companions turned at the direction where he was staring, puzzled. “Legolas, what is it? And if you dare to give me bad news again –” Asthaldo said, suddenly noticing that he was whispering. “A Balrog,” Shannai whispered barely audibly, feeling the fear gather around him in the others as well. “What did you just say about ‘bad news’?” Thalión said to his cousin, who as a response only stared at the hallway. Slowly, nearly agonisingly so, the shadow approached. The Orcs went wild, running around and shouting with their foul tongue, while the Elves pulled back, every one of them feeling the presence of the dark demon now. 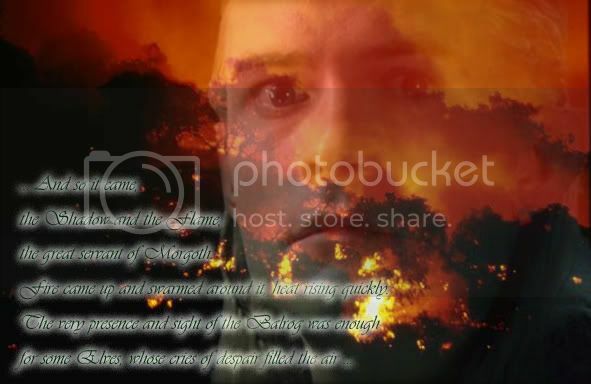 And so it came, the Shadow and the Flame, the great servant of Morgoth. Fire came up and swarmed around it, heat rising quickly. The very presence and sight of the Balrog was enough for some Elves, whose cries of despair filled the air. Legolas had never believed that he would be forced to meet this demon again, thinking that Gandalf had killed the last one years ago in the darkness called Moria. But now it seemed that he had been wrong: there was yet another. And this time they had no Wizard for their aid. Slowly Legolas gathered himself, forcing his eyes to meet their greatest enemy. At least I can die fighting, and maybe earn my place in great songs, if any songs will be made of this battle. With these thoughts he attacked, knowing that running away was only another, bad option. He would rather stand against the enemy and defend the ones he loved and his home, even if it would only know a swifter death; even if he would run away now, he would most likely die eventually, because the enemy was too great and the Orcs too many. Distantly he heard Rafél shout his name, knowing that if he survived, his former protector would lecture him long and thoroughly of his foolishness. When the Prince of Woodland Realm crushed to the line of Orcs, the shouts around him told that he was not alone. There were others fighting with him, the Elves of former Mirkwood standing in one more desperate battle against the dark. And every one of them knew that tonight they could all die.